What are acromioclavicular joint (ACJ) injuries? The acromioclavicular joint is found the on the top of the shoulder and is formed between the collarbone (clavicle) and the acromion, which is part of the shoulder blade. The ACJ can be injured either acutely following an injury or chronically over time due to wear and tear. Acute disruption to the ACJ occurs when people fall directly onto the point of the shoulder. Injuries are seen in sports such as rugby, martial arts and horse riding. The shoulder and arm are forced away from the collarbone and the soft tissue ligaments that support and provide stability to the joint are damaged. The extent of the injury can be graded according to its severity and this will determine the treatment. Gradual wear and tear of the ACJ can lead to chronic pain and degeneration of the joint. Pain is felt over the top of the shoulder and often patients can point with one finger to site if the problem. How are ACJ injuries diagnosed? 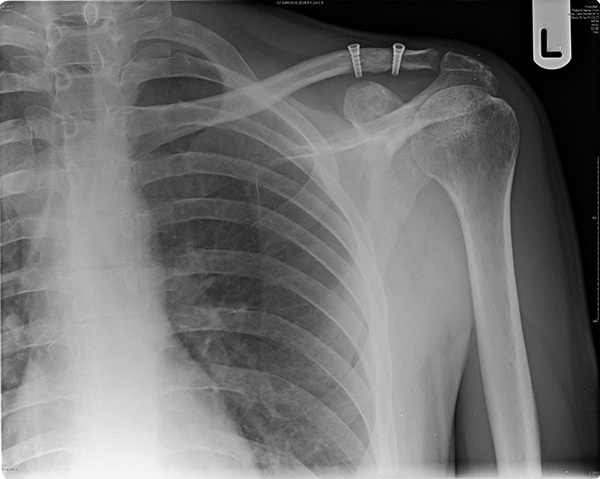 A clinical history of fall onto the point of the shoulder is common. 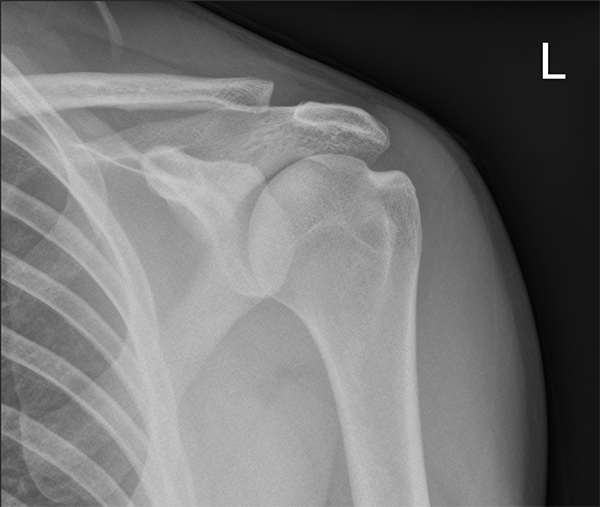 There may be disruption to the ACJ with a “lump” noticed at the end of the collarbone. An X-ray will confirm the diagnosis. 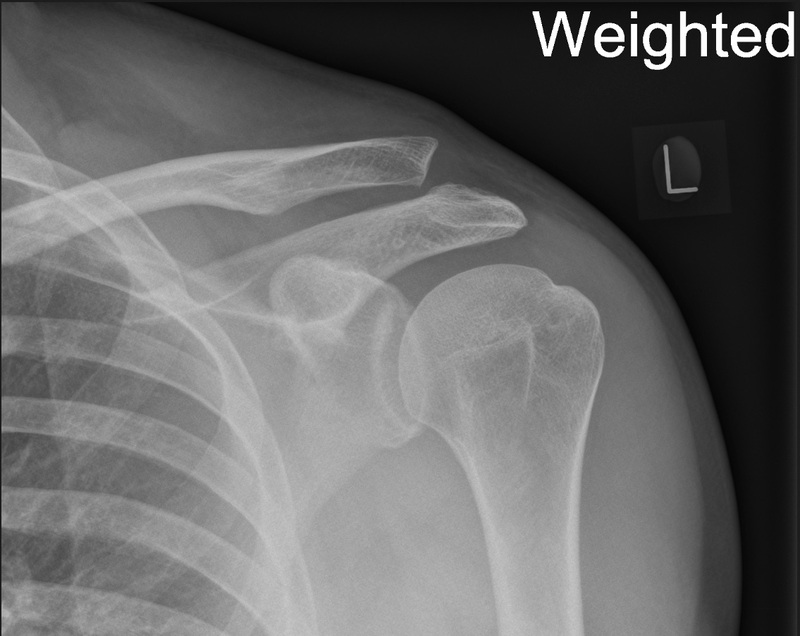 ACJ injuries are then graded according to the position of the collarbone in relation to the acromium as seen on X-ray. In mild injuries there is little or no displacement of the joint (Grade 1 or 2). Further displacement of joint, equivalent to 100% separation, is grade 3. More than 100% is graded as 5. Grade 4 relates to backward (posterior) displacement and Grade 6 is almost never seen. How are ACJ injuries treated? Most grade 1 or 2 injuries will settle with time, painkillers, ice and rest. The treatment of grade 3 injuries remains controversial. Most grade 3 injuries will settle with conservative management over a period of three months. If the joint remains symptomatic and unstable following a period of non-surgical treatment, surgery to reconstruct the ACJ can be performed. Surgery is generally recommended for ACJ separation grades 4-6. There are many techniques described to repair or reconstruct the ACJ. The aim of surgery in acute injuries, treated within a few weeks, is to re-approximate the torn ligaments and to protect the repair while healing takes place. In chronic disruption (weeks to months after injury) a ligament reconstruction with either an artificial ligament or tendon graft will be required. Surgery may be performed open (through a skin incision) or with keyhole (arthroscopic) assistance. The risks of surgery are low, with very low risks of infection, bleeding and nerve injury. There is a small risk of shoulder stiffness, which generally improves with time. There is a small risk of failure of fixation, most likely in the early stages after repair, if the rehabilitation is not followed. A sling is required for three to six weeks depending on the procedure and individual circumstances. The patient will be seen by a physiotherapist within a week of surgery to start controlled movements of the shoulder before progressing through a rehabilitation programme. Driving can resume after six weeks and return to contact sports at three months.